Today I decided to put the 4 white shelves I bought from Ikea 2 or 3 years ago. These are 3inches deep shelves which can be connected to form a longer row of shelving system for frames and small objects. 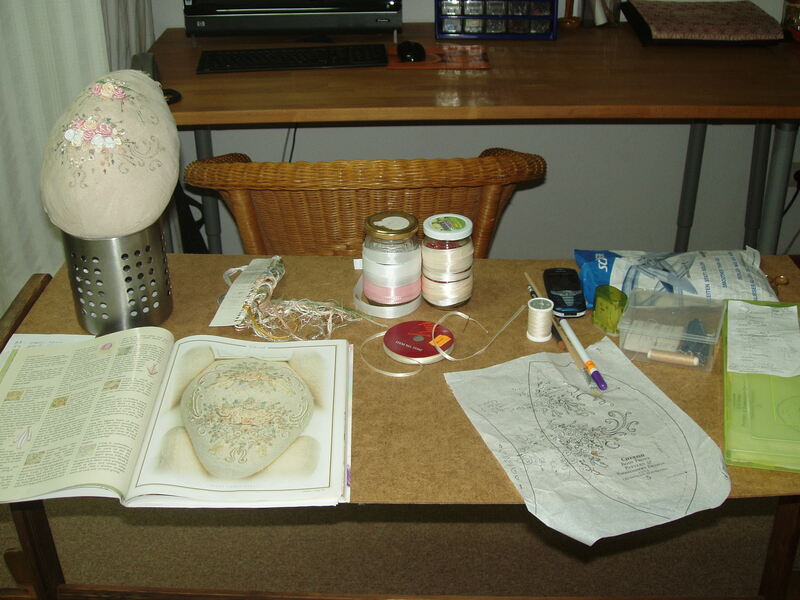 On the side table I have Jane Nicholas´Stumpwork book and Royal School of Needlework book plus a japanese craft book. 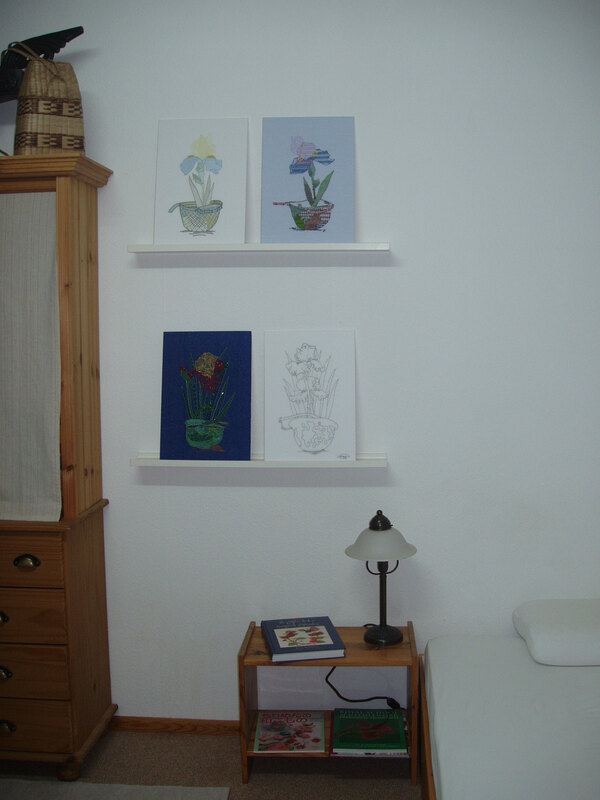 My first four embroideries on the series Peace already find their places on the shelves. 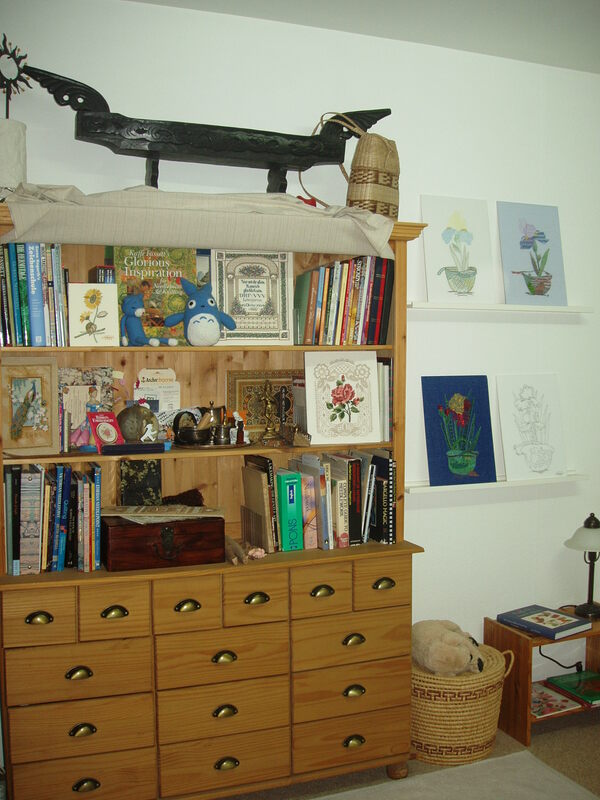 My largest embroidery is Thea Gouverneur´s Birdhouse, I placed it on another of the white shelf. 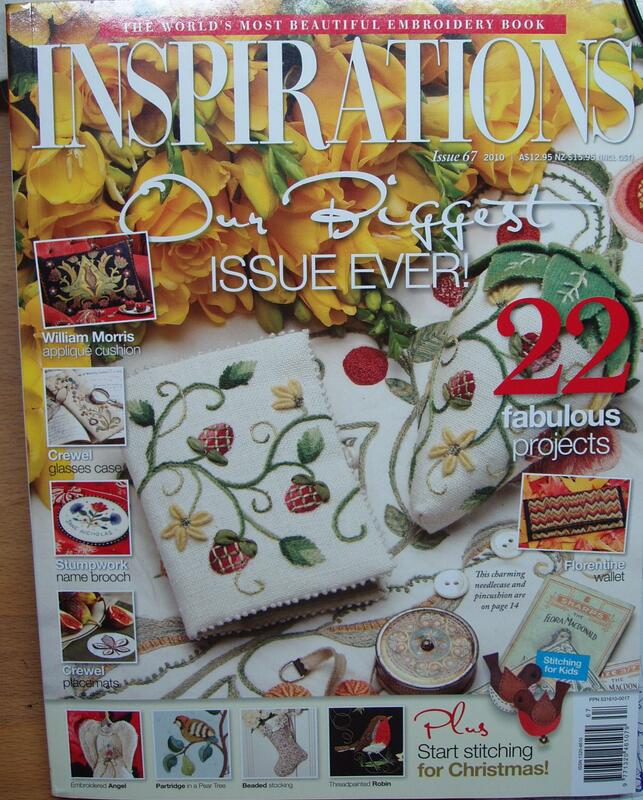 Next to it is my long and short needlepoint of Elian McCready´s Hollyhocks and Peonies. On the other side of the wall hangs a Benguet backstrap loom, finished but uncut, with all the wooden parts used in weaving the fabric. 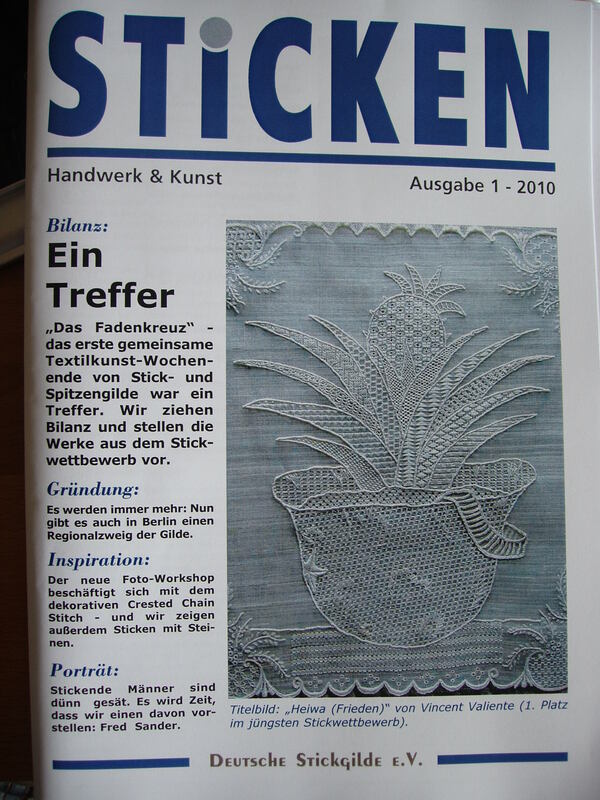 On the table frame stand, I still have the WIP of my Yellow Sampler/ Cutwork or Drawnwork stitches. I am working on the bear´s body now. I use a cylinder to raise my work a bit higher. I wind the ribbons on glass jars. 🙂 I use cotton buds plastic boxes for my needles. I use a vanishing fabric pen to draw the designs. I also use permanent waterproof pen if I know I would be able to cover the lines entirely with stitches, like on this project. I like handmade ethnic or native products. This shelf has my favorite books, tools and finished projects from embroidery to sculpting to painting. I have too many interests and have tried to develop so many skills from so many fields (theater, opera, piano, ballet, massage therapy, painting, etc. 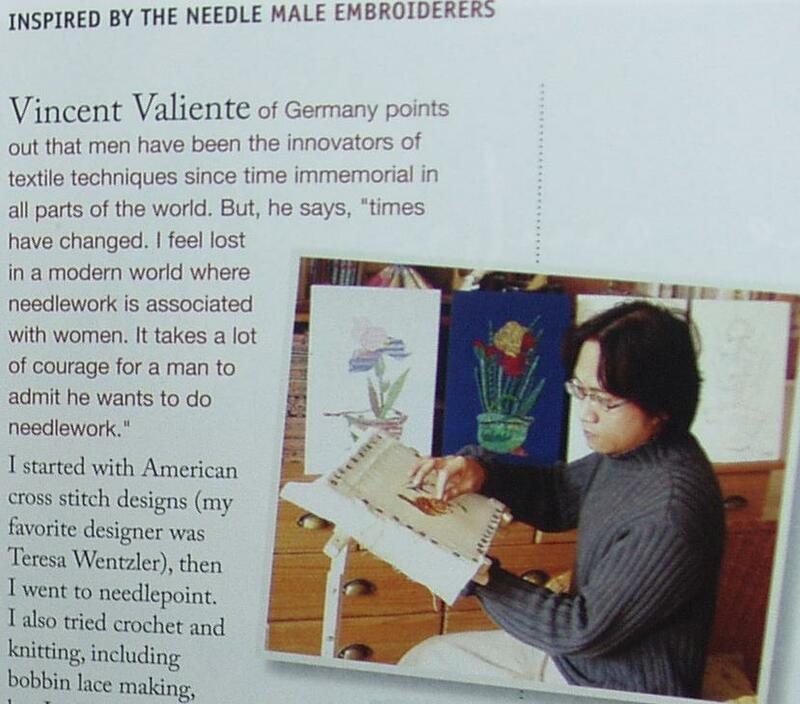 ), that it was extremely necessary for me to make a decision to improve on one field only, and I chose embroidery. Finally, after so many years, not having a public blog, I decided to keep one. This is to help me keep focused on my projects and my art. Endlich, nach so vielen Jahren ohne einem Blog, entschloss ich mich einem zu halten. 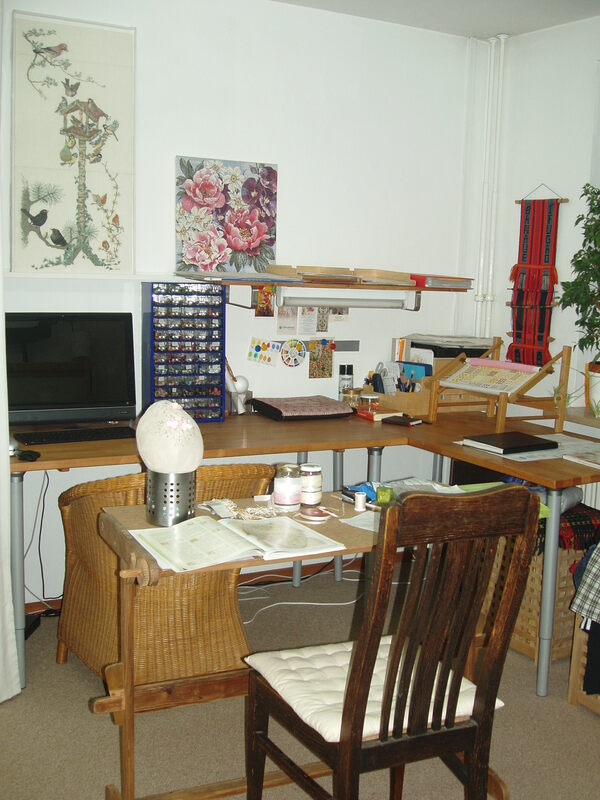 Ein Blog hilf mich, mehr auf meine Projekte und Kunst zu konzentrieren.